In 1994, Prof. Shirasaka received a Master’s degree in Astronautics from the University of Tokyo and immediately joined the Mitsubishi Electric Corporation. Since then, he has worked for several space system development projects as a systems engineer. For twelve years, he especially focused on the HTV project, which is the Japanese transfer vehicle to the International Space Station, from the beginning to the end. 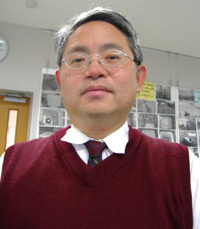 He has served as Associate Professor of the Graduate School of System Design Management, Keio University, since 2010. He graduated from the University of Maryland in 1981, with a BS degree in electrical engineering. He then received a master's degree in the same field from Cornell University in 1982. He went to work for AT&T Bell Laboratories from 1982 to 1989 designing hardware and software for long-haul, near gigabit-per-sec, optical fiber repeaters. Next he backpacked all over the world for three years. He worked at Panasonic (in Japan) on telecom projects from 1992 to 2004 as a quality control engineer; at Panasonic he mastered the Japanese language. From 2005 to 2015, George Maeda installed real time fluxgate (MAGDAS) magnetometers all over the world for ICSWSE (Int'l Center for Space Weather Science and Education) at Kyushu University; MAGDAS is regarded as the world’s largest array of magnetometers, with 72 units. In July of 2015, he began working at Kyutech in the LaSEINE laboratory of Prof. Mengu Cho. He is currently the Research Coordinator of the BIRDS Project, whose website is http://birds.ele.kyutech.ac.jp/. If you visit this website, you can view all past issues of the BIRDS Project Newsletter. He is the editor of it. The satellites of BIRDS (Japan, Ghana, Bangladesh, and Mongolia) are scheduled to be in orbit by the summer of 2017.